The Womens Exolight Slope Pants from Jack Wolfskin are fully waterproof and highly breathable, making them the ideal choice for ambitious ski tours.The high performance Texapore Softshell Infinity Hyproof fabric shuts out the cold wind and keeps you dry in the rain, sleet or Snow. And because the fabric is stretchy and expels moisture vapour effectively to the outside, the wear comfort is superb.Scuff guards made of extremely hard wearing fabric protect the trouser cuffs from wear and tear from ski boots and ski edges. 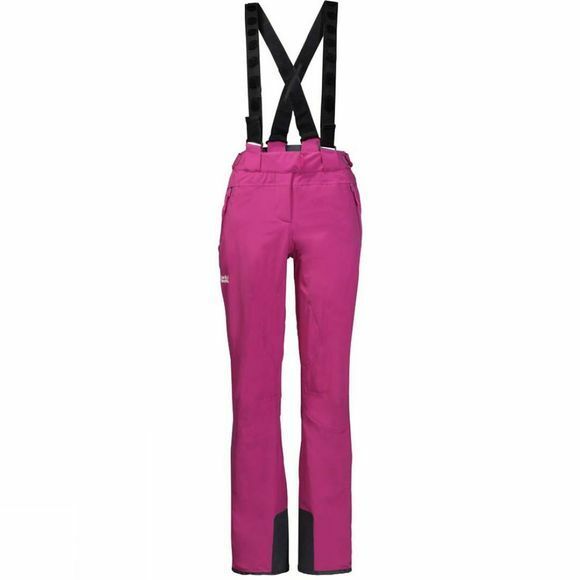 With an integrated RECCO chip, detachable braces and a ski pass pocket, the Exolight Slope Pants are the perfect choice for your next big skiing adventure.